Peekaboo! This little adorable seahorse is actually an adult Pygmy Seahorse, but because of their tiny stature and babyish proportions, they are also called as Baby Seahorse in some regions. 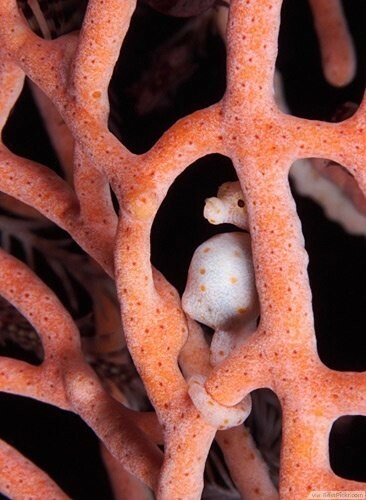 A full grown Pygmy Seahorse only reaches up to 2 cm in length. In addition to their size, they love to hide-and-seek among the branches of fan corals which makes it very hard to see them. So, the next time you go diving near fan corals, try to find them. The trick is to stay very still at least 25 cm away from the coral. This is to ensure the seahorses’ and also the corals’ safety as they are both very delicate creatures. You might be surprised at how many you would find in just one fan coral. Who knows, if you have an amazing eyesight, maybe you would even be able to detect their babies too.